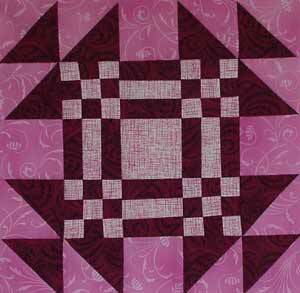 This block is shown with three fabrics in one color scheme, but is great with more colors and fabrics. The interior of the block could be a block on it�s own. Sections of the block could be parts of a border design. This is also great for block exchanges. 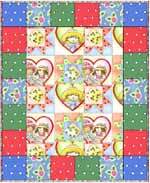 See Quiltin' & Rockin' With Aunt Pitty Pat Vol. #3 for more information on block exchanges. Light	3 �" x 36"
A 12 Medium Cut six 3 �" x 3 �" squares. Cut in half diagonally once. B 12 Dark Cut six 3 �" x 3 �" squares. Cut in half diagonally once. 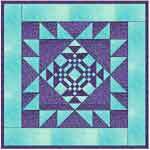 C 20 Light Cut twenty 1 �" x 1 �" squares. D 16 Dark Cut sixteen 1 �" x 1 �" squares. 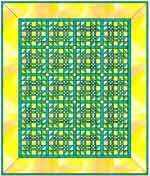 E 4 Medium Cut four 2 7/8" x 2 7/8" squares. Step 1:	Sew a Dark G rectangle to either side of a Light F rectangle. Press seams toward the dark. Repeat 3 more times. You have four Rail Fence Units. Step 2:	Sew a Light C square on either side of a Dark D square. Press seams toward the dark. Repeat seven more times. Unit 1. 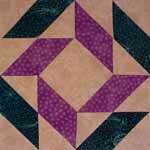 Step 3:	Sew a Dark D square on either side of the remaining four Light C squares. Press seams toward the dark. Unit 2. Step 4:	Sew a Unit 1 to either side of each of the four Unit 2s. Press seams open or to one side. You have four Nine Patch Units. Step 7:	Sew Interior Rows 1, 2, and 3 together. Press seams toward Row 1 and 3. This Interior Section makes a block that can be used on it's own for another project. Step 9:	Sew an A/B Unit to either side of two Light E squares. Press seams toward the A/B Unit. Step 10:	Sew the two A/B-E strips to either side of the Interior Section of the block made in Step 7. Press seams toward the outside edge or the A/B-E Strips. Step 11:	Sew two A/B Units to either side of the remaining two Light E squares. Press all seams toward the center square E.
Step 12:	Add these last two A/B-A/B-E-A/B-A/B strips to either side of the block to complete this pattern. Whew!! You did it! Hurrah! !